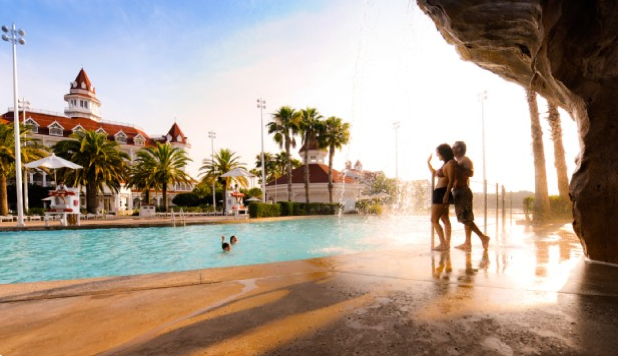 We’ve given you the basics about Disney resort pools in general and the specifics about the pools at the value and moderate level hotels. 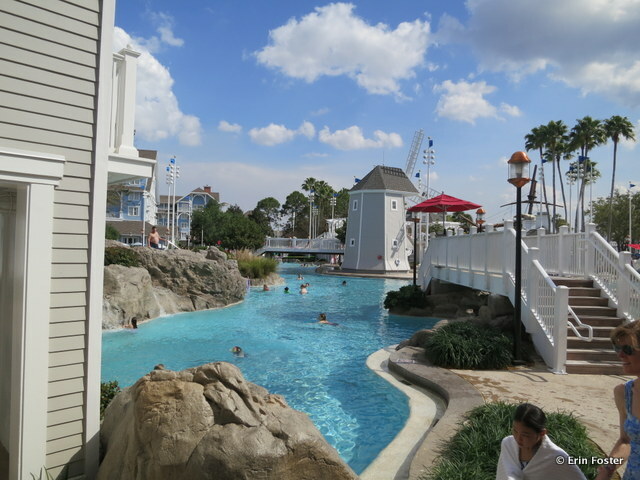 The series concludes with an in-depth look at the pools at the Walt Disney World deluxe and villa resorts: Animal Kingdom Lodge and Villas, Boardwalk Inn and Villas, Contemporary Resort and Bay Lake Tower Villas, Grand Floridian, Old Key West, Polynesian, Saratoga Springs and Tree House Villas, Wilderness Lodge and Villas, and the Yacht & Beach Club and Beach Club Villas. How many pools are there? 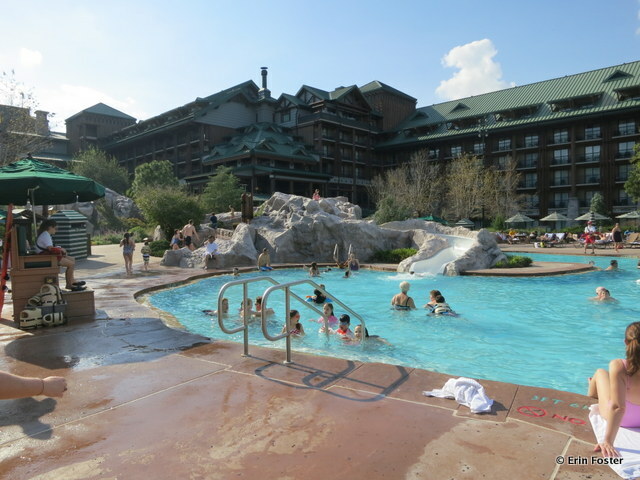 There are two large pools at the Animal Kingdom Lodge, the Uzima pool at the main Jambo House, and the Samwati Spring pool in the Kidani Village villas area. There is no “quiet pool” area at the Animal Kingdom Lodge. What is the pool themeing? The African wilderness. What’s the kiddie pool situation? 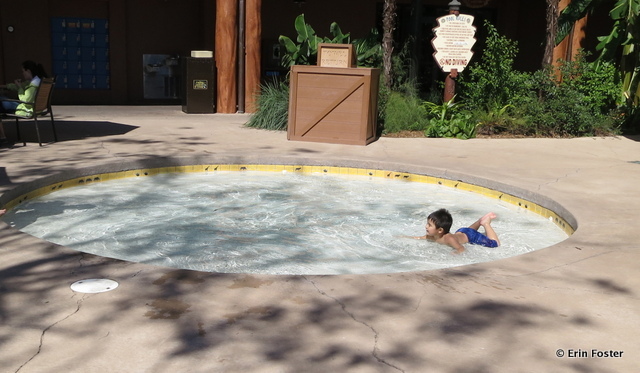 There are traditional kiddie pools in both the Jambo and Kidani pool areas. 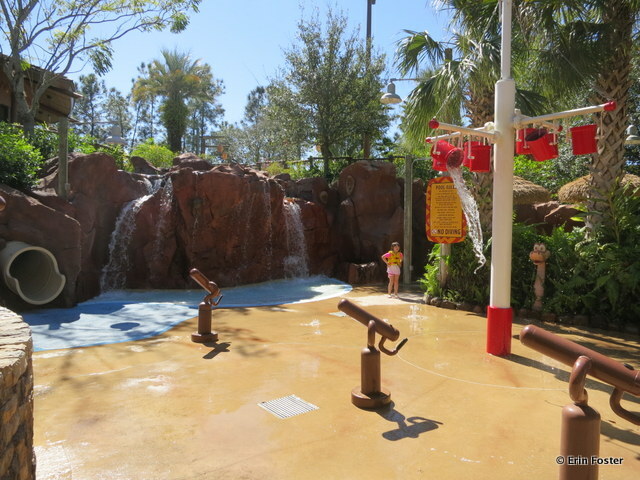 Additionally, Kidani has a large interactive water play area intended for children under 48″ tall. Are there water slides? Yes, both pool areas have water slides. 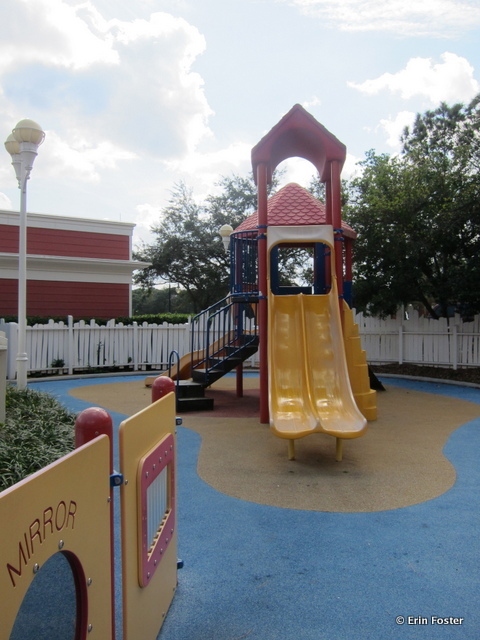 At Kidani, there is a small slide, appropriate for preschoolers, as well as a larger slide for older children. At Jambo, there is one large water slide. Is there a nearby playground? Yes. 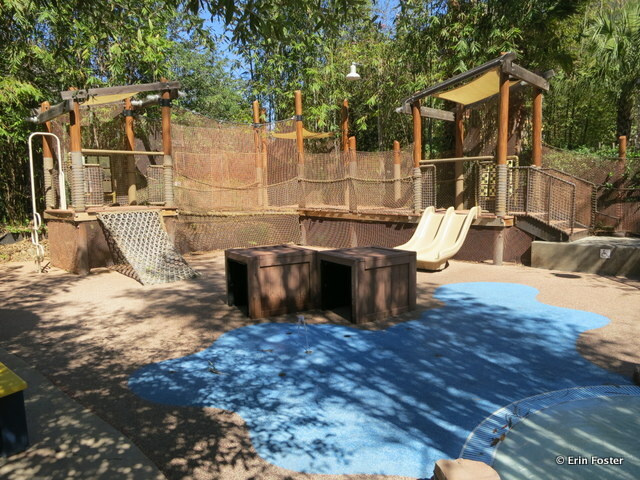 There are playgrounds near both the Jambo and Kidani pool areas. What’s the nearest food option? 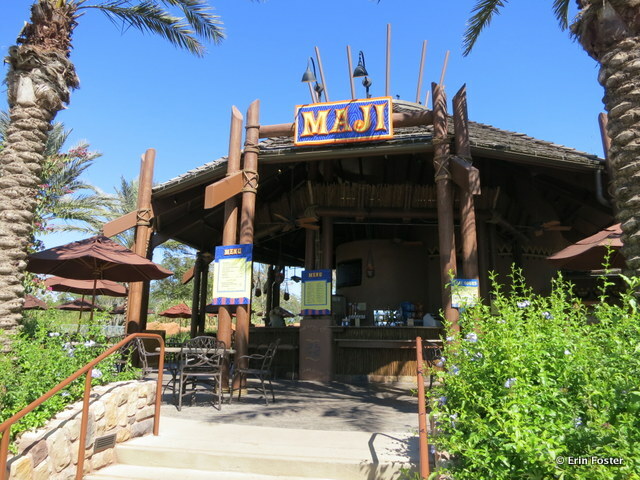 The Maji bar next to the Kidani pool offers drinks and very limited number of cold sandwich options. The Uzima Springs bar next to the Jambo pool offers drinks and a small selection of packaged snacks. The Mara quick service restaurant, with complete food offerings, is steps away from the Jambo pool. Are there showers at the pool? 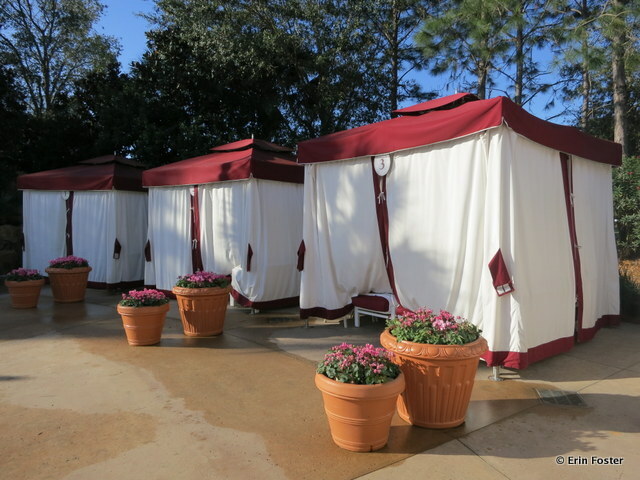 Yes, there are restrooms with lockers and shower adjacent to both the Jambo and Kidani pool areas. Are there hot tubs? 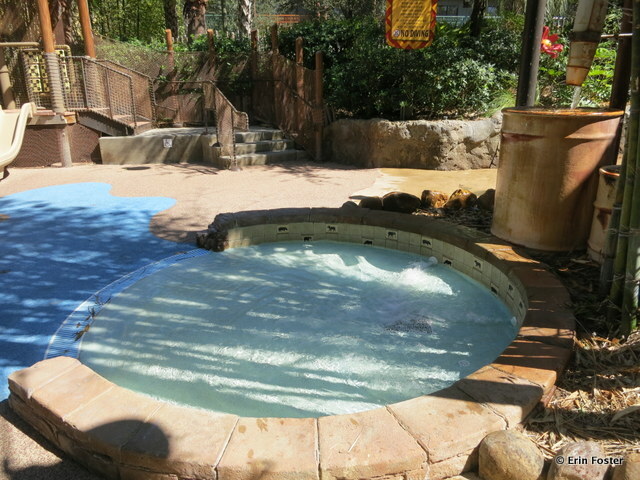 Yes, there are hot tubs at both the Jambo and Kidani pool areas. Are there towels available at the pool? Yes, towels are available at both pools. How deep is the pool? The Jambo pool is four feet, ten inches at its deepest point. 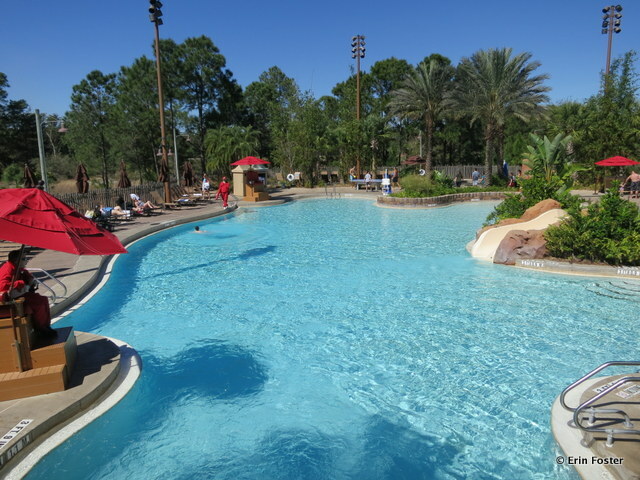 The Kidani pool is four feet, eleven inches at its deepest point. Are there zero entry pools available? Yes. 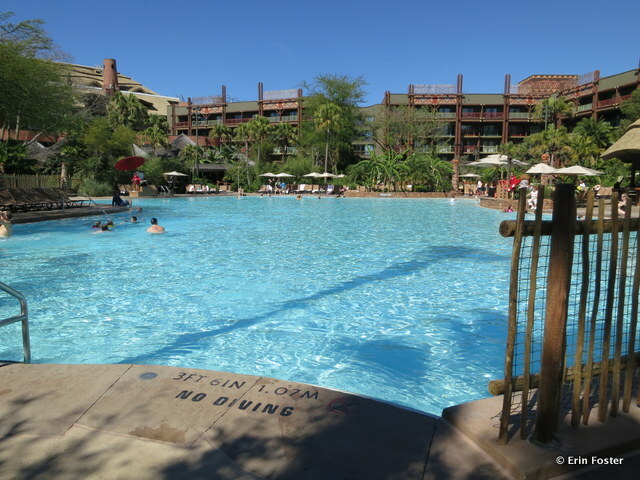 The main pools at both Jambo and Kidani have zero entry access. Are poolside cabanas available? No. Are there poolside activities? Yes. 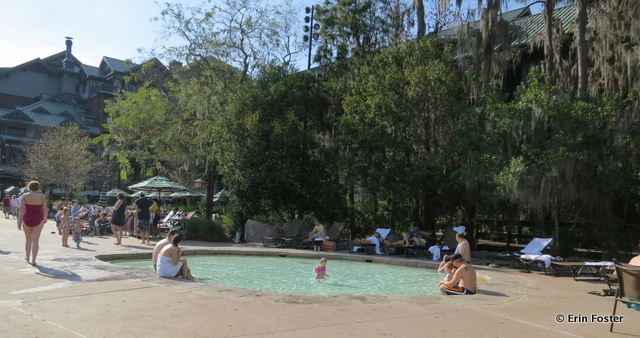 There are activities at both the Jambo and Kidani pools. Schedules may vary seasonally, but recently there were planned events from 1:00 p.m. until 7:00 p.m. every afternoon, plus a movie under the stars in the evening. Events may include: Bingo, Wild Trivia, Frisbee Toss, Giant Jenga, Chalk Art, Musical Rings, and others. Weather permitting, there is a free campfire with s’mores. Anything else? The two sections of the Animal Kingdom Lodge are a substantial walking distance apart. 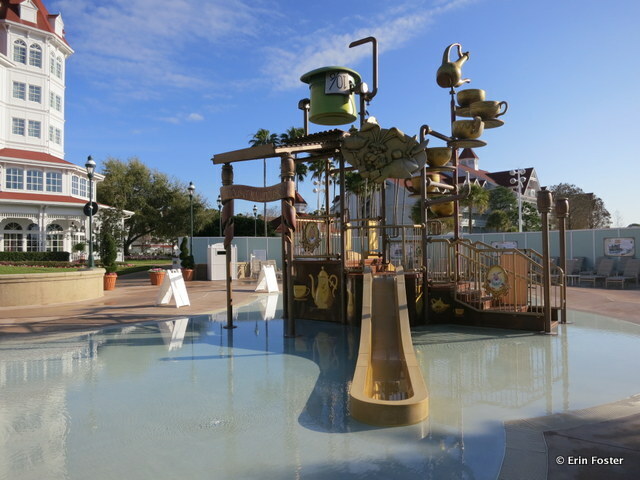 Guests with preschool and elementary age children may prefer the pools at Kidani Village due to the appealing children’s water play area. Different evening movies are shown at the Jambo and Kidani areas. Feel free to view whichever film is more appealing to your family. The schedules for both will be available at the front desk. How many pools are there? Three. The main feature pool is called Luna Park. 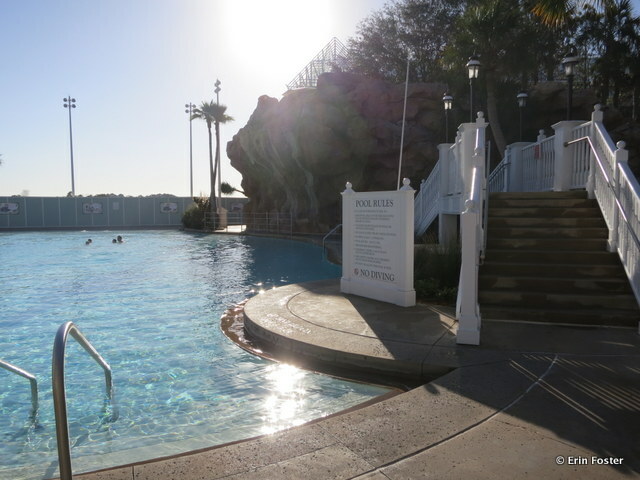 There are also two smaller “quiet pools,” one each on the Boardwalk Inn and Boardwalk Villa sides of the resort. What is the pool themeing? Atlantic seaside boardwalk, circa 1930. What’s the kiddie pool situation? There is a traditional kiddie pool in the Luna Park area. Are there water slides? The centerpiece of the Luna Park pool is a water slide fashioned to look like a wooden roller coaster. The slide exit features a GIANT clown mouth. 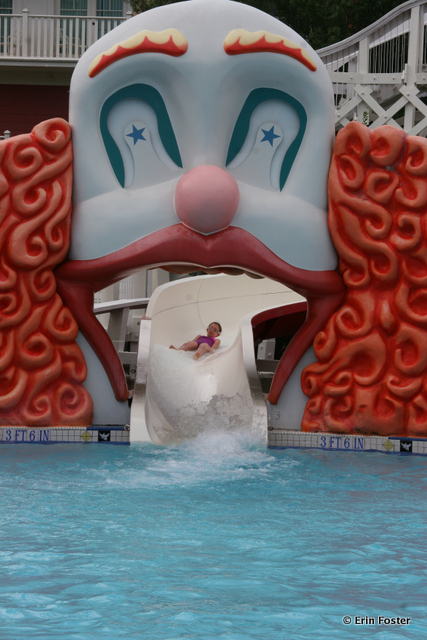 The slide itself is fairly average, but the clown mouth has been known to frighten more than a few coulrophobes. Is there a nearby playground? Yes. There is playground in the Luna Park area. What’s the nearest food option? Leaping Horse Libations, adjacent to the Luna Park pool, offers drinks and basic cold sandwiches. There are no food options at the other pools. Are there showers at the pool? Yes. There are showers at the Muscles & Bustles health club, adjacent to the Luna Park area. Are there hot tubs? Yes, there are hot tubs near all three pools. Are there towels available at the pool? Yes. How deep is the pool? The Luna Park pool is four feet, ten inches at its deepest point. The other pools are five feet at their deepest point. Are there zero entry pools available? No. Are there poolside activities? Yes. Activities take place at the Luna Park pool. Schedules may vary seasonally, but recently there were planned events from 1:00 p.m. until 6:00 p.m. every afternoon, plus a movie under the stars in the evening. Events may include: Ping Pong Toss, Noodle Races, Duck Scramble, Hot Potato, Mr. Potato Head Relay, Ladder Golf, and others. Additionally, the Community Hall next to the Villas quiet pool offers other activities such as ping pong and board games. Weather permitting, there is a free campfire with s’mores. There are often hair wrap artists located at the main feature pool mid-day. Anything else? Seriously, the clown pool is a big thing for some kids. If you’re thinking of staying at the Boardwalk, make sure your child has no fear of clowns. How many pools are there? Three. 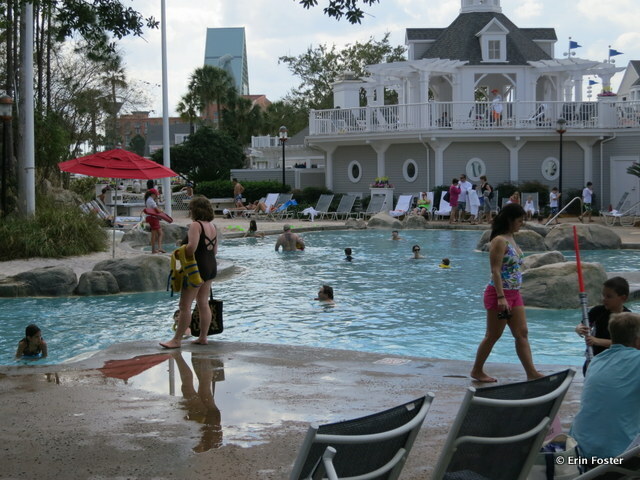 Two at the Contemporary main building (one large feature pool and one nearby smaller quiet pool) and one at the Bay Lake Tower building. 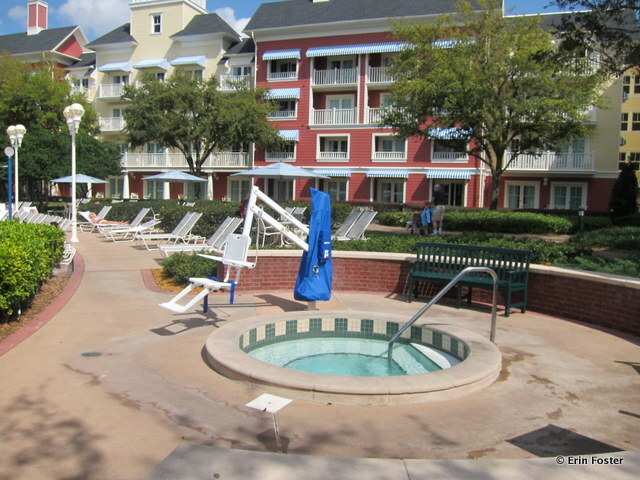 Signage indicates that amenities at Bay Lake Tower, including the pool, are restricted to BLT guests. No such signage exists on the main Contemporary side. What is the pool themeing? Um, contemporary. What’s the kiddie pool situation? 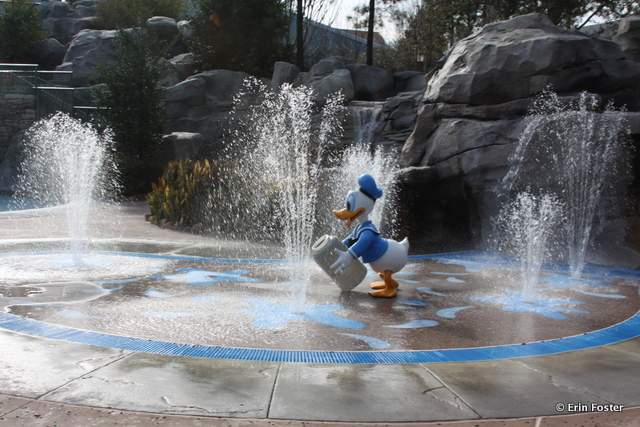 There are no traditional kiddie pools, but there are children’s water play areas at both locations. Are there water slides? Yes. 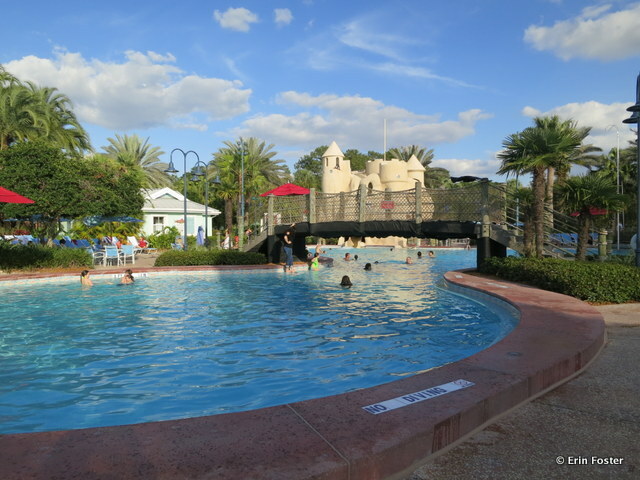 There are medium-sized water slide at both the Contemporary and Bay Lake main pools. There is also a small slide, appropriate for preschoolers, at Bay Lake. Is there a nearby playground? Not really. 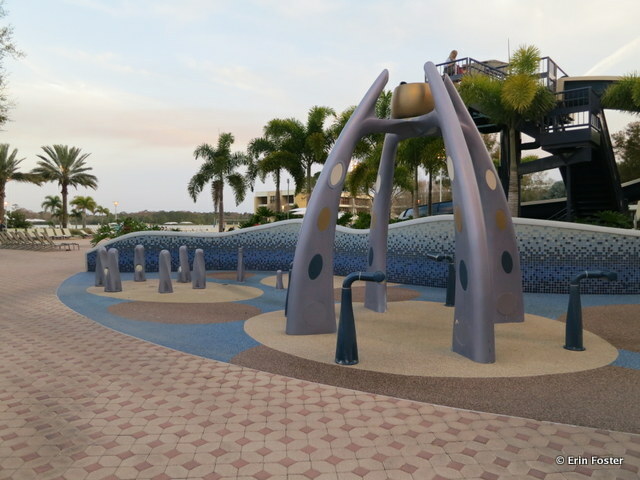 The nearby beach area provides a place for kids to run around, but there are no climbing structures. What’s the nearest food option? 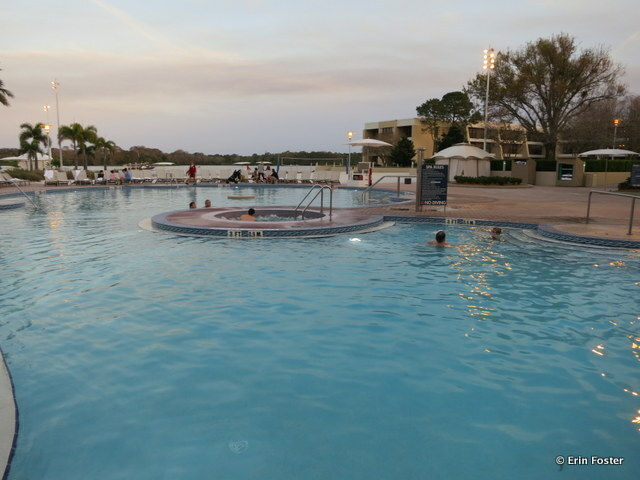 The Sand Bar at the Contemporary pool offers drinks, hot sandwiches, salads, and ice cream. The Cove Bar at the Bay Lake Tower pool serves drinks and basic cold sandwiches. Are there showers at the pool?Yes, there are showers in the restroom at the main Contemporary pool. 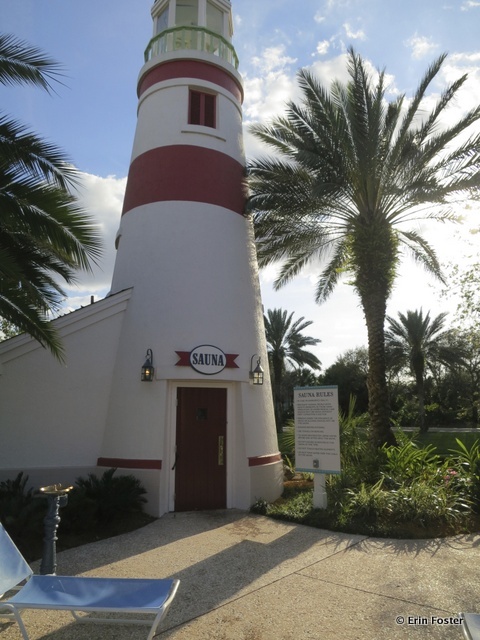 There are no indoor showers at the Bay Lake pool. Are there hot tubs? 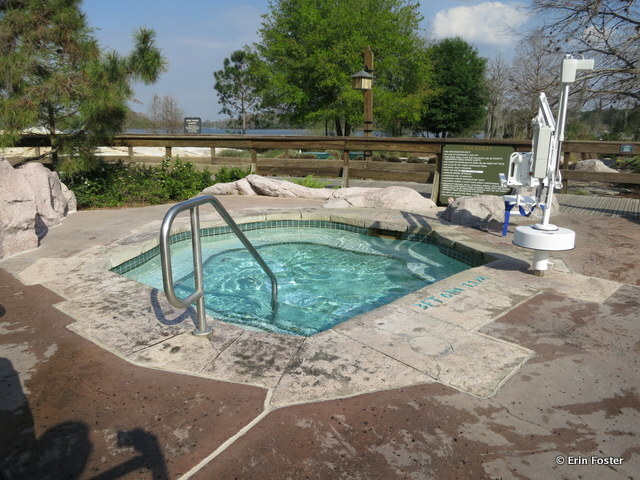 Yes, there are hot tubs in both locations. How deep is the pool? The Contemporary main pool is four feet at its deepest point. 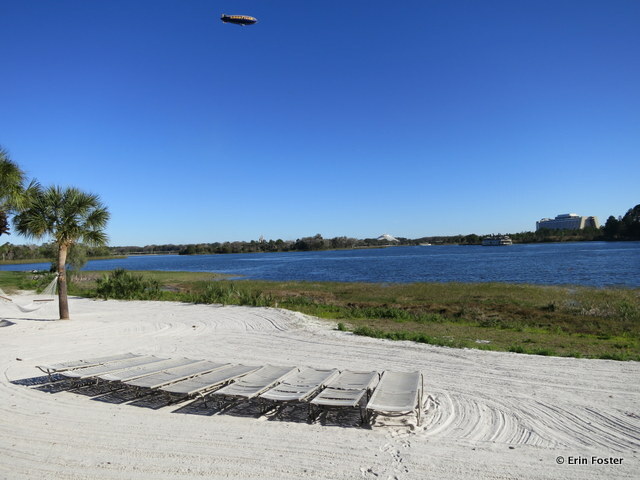 The Bay Lake pool is four feet, six inches at its deepest point. Are there zero entry pools available? Not at the Contemporary, but there is zero entry at Bay Lake. Are poolside cabanas available? Yes, cabana rentals are available at the main Contemporary pool. Are there poolside activities? Yes. Activities take place at both main pools. Schedules may vary seasonally, but recently there were planned events from 1:00 p.m. until 6:00 p.m. every afternoon, plus a movie under the stars in the evening. Events may include: Hula Hoop Games, Dance Party, Cup Stacking Challenge, Bingo, Chalk Art, Wacky Bowling, and others. Additionally, the Community Hall next to the Bay Lake pool offers other activities such board games. 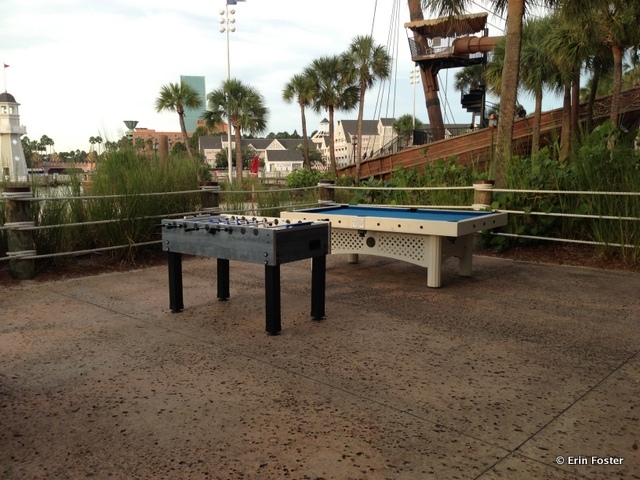 There is an outdoor billiards table at the Contemporary pool, as well as a volleyball net on the nearby beach. 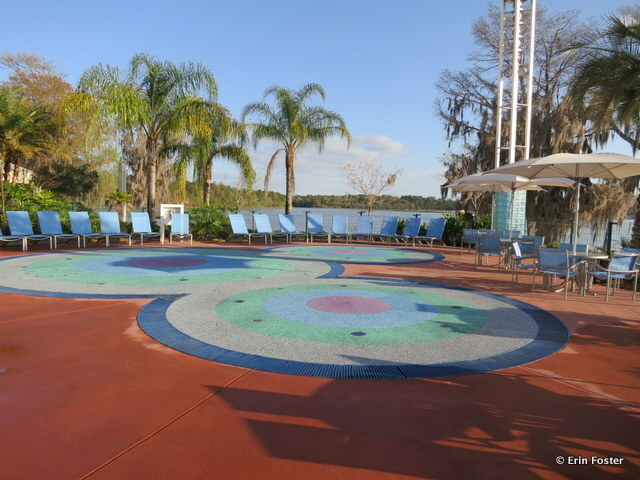 Ping Pong and shuffleboard are available at the Bay Lake pool. Weather permitting, there is a free campfire with s’mores. Anything else? The marina next to the Contemporary pool offers numerous boating and water sports opportunities. While there are plentiful beaches here, there is no swimming allowed in the lake. How many pools are there? Currently two. The Courtyard pool is smaller and quieter. The Beach is larger, with interactive elements. When the new villas area opens, there may be an additional pool. What is the pool themeing? Victorian beach. What’s the kiddie pool situation? There is a brand new children’s interactive play area at the Beach pool, themed to Alice in Wonderland. Are there water slides? Yes. 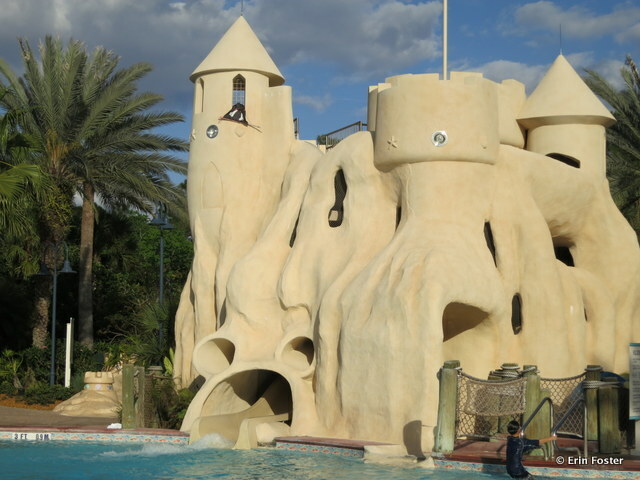 There is a large waterslide at the Beach pool as well as a smaller slide integrated into the children’s water play area. Is there a nearby playground? 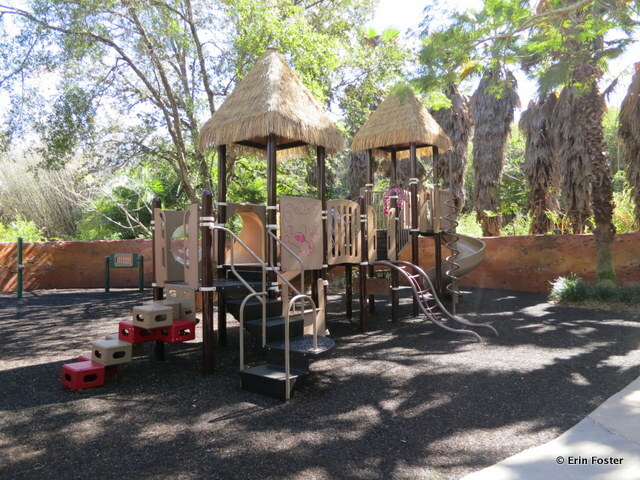 There’s no traditional playground, but there are beach and grassy areas where kids can run around. What’s the nearest food option? The Beach Pool and Courtyard Pool bars offer drinks, as well as a selection of salads and hot and cold sandwiches. Are there showers at the pool? Yes, the rest room nearest to the Beach pool includes lockers and showers. Are there hot tubs? Yes, there is a hot tub near the Courtyard pool. How deep is the pool? The pools are four feet at their deepest point. Are there zero entry pools available? Yes, the Beach and Courtyards pools are zero entry. Are poolside cabanas available? 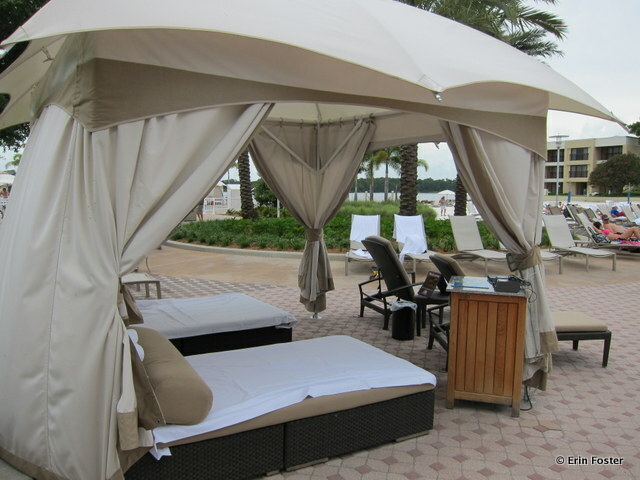 Yes, there are cabana rentals available at the Beach pool. Are there poolside activities? Yes. Activities take place at the Beach pool. Schedules may vary seasonally, but recently there were planned events from 1:00 p.m. until 6:00 p.m. every afternoon, plus a movie under the stars in the evening. 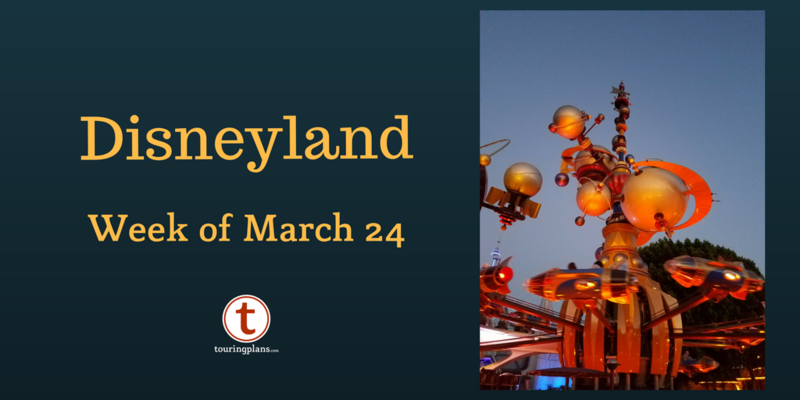 Events may include: Mickey Memory, Dance Party, Relay Games, The Claw, Candy Sink, Ring Toss, and others. There is a ping pong table near the Beach Pool bar. Anything else? While the Grand Floridian sometimes has a reputation of being stuffy, children truly are welcome. 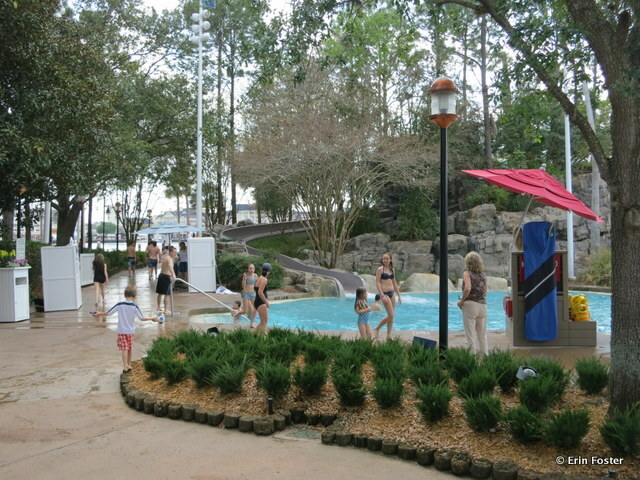 Kids of all ages play in both pools. The Grand Floridian typically does not offer an evening campfire, but you’re welcome to head over to the Polynesian or Contemporary to enjoy the festivities there. While there are plentiful beaches here, there is no swimming allowed in the lake. The Grand Floridian is in the process of completing a Disney Vacation Club villa addition to the resort. Changes are ongoing during this construction. How many pools are there? Four. One main feature pool and three smaller pools. What is the pool themeing? The beach at Old Key West. What’s the kiddie pool situation? 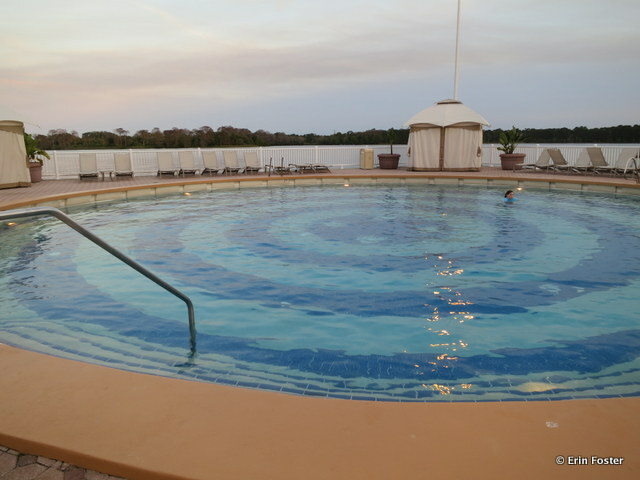 There is a traditional kiddie pool at the main feature pool complex. Are there water slides? Yes. There is a medium-sized slide at the feature pool. Is there a nearby playground? Yes. There playgrounds adjacent to all the pools. What’s the nearest food option? 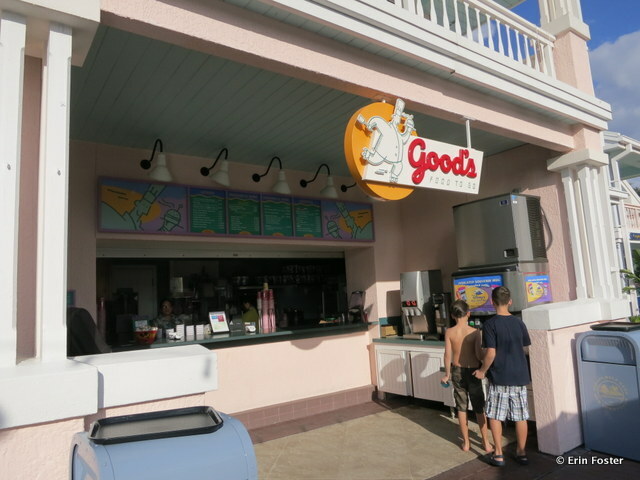 The Good’s To Go snack bar at the main feature pool offers drinks, as well as a selection of salads and hot and cold sandwiches. 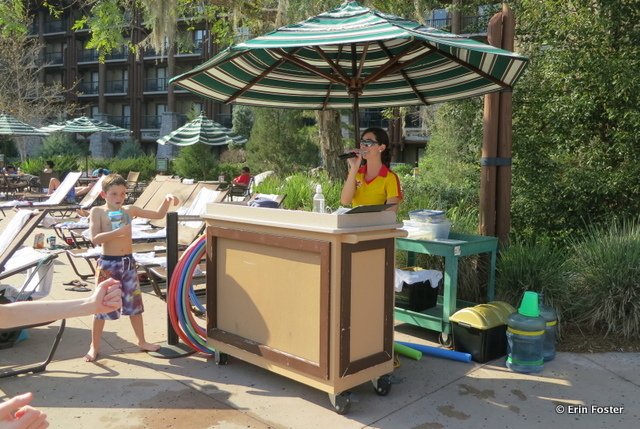 There is a snack bar at the pool in the Old Turtle Pond Road section of the resort. The Turtle Shack offer pizza and a limited selection of cold sandwiches. This venue is open seasonally. No food offerings are available at the other pools. Are there showers at the pool? Yes. There are showers and lockers in the restrooms adjacent to the main feature pool. Are there hot tubs? Yes, there is a hot tub at the feature pool. Are there towels available at the pool? Yes, towels are available at the feature pool. They may or may not be available at the quiet pools. How deep is the pool? The main feature pool is four feet at its deepest point. Other pools may be up to four feet, eight inches deep. Are there poolside activities? Yes. Activities take place at the feature pool. Schedules may vary seasonally, but recently there were planned events from 1:00 p.m. until 6:00 p.m. every afternoon, plus a movie under the stars in the evening. Events may include: UnBirthday Party, Oversized Games, Jeopardy, Football Fun, Marvel Mayhem, Key West Treasure Hunt, and others. There are numerous craft and quiet game activities in the nearby community hall, as well as bike rentals. Weather permitting, there may be a free campfire with s’mores. Campfires are only a few days a week at OKW, check your resort schedule for details. Anything else? Old Key West has a poolside sauna available for guest use. How many pools are there? Two. The main feature pool is the volcano pool. A quiet pool is located on the other side of the Samoa building. What is the pool themeing? Polynesian island. What’s the kiddie pool situation? There is no traditional kiddie pool, but there is a children’s splash pad. Are there water slides? Yes. There is a large slide coming out of the volcano. Is there a nearby playground? 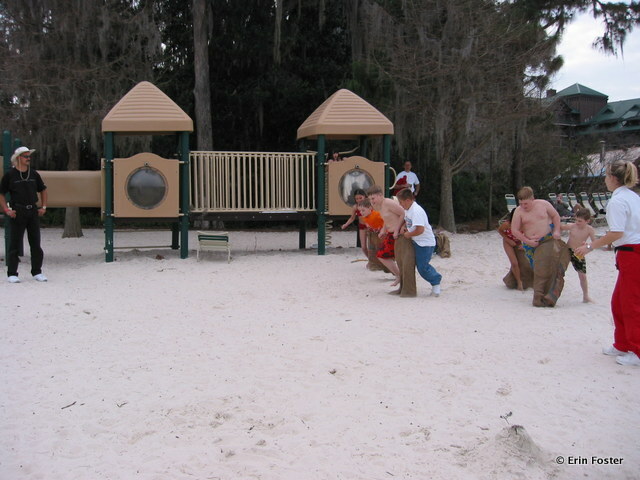 There is no traditional playground, but the beach area provides a large place for kids to run around and play. What’s the nearest food option? 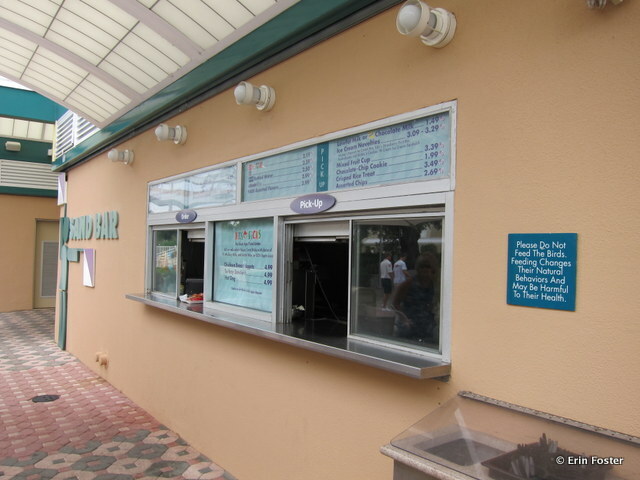 The Barefoot Pool Bar, adjacent to the volcano pool, offers drinks and a very small selection of packaged snacks. 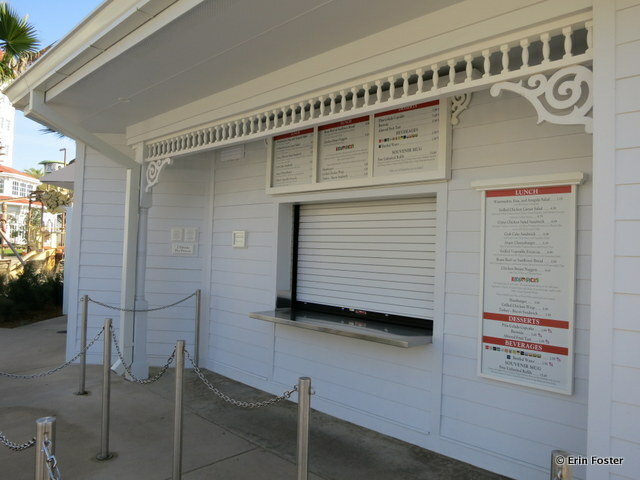 More food offerings are located inside the main building at Captain Cook’s quick service restaurant. There are no food offerings at the quiet pool. Are there showers at the pool? Yes, there is a locker room with showers located under the volcano. Are there hot tubs?No. 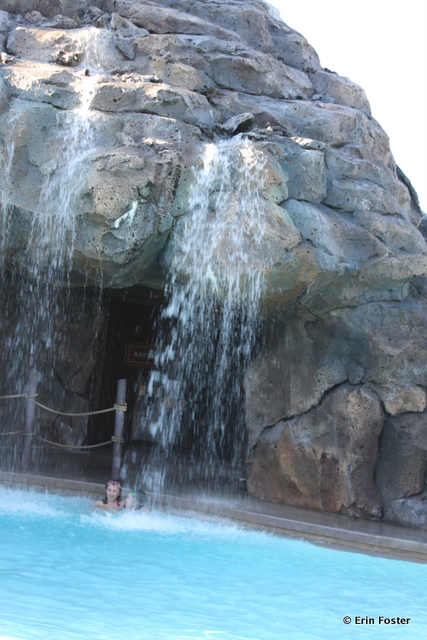 The Polynesian is the only deluxe resort without a hot tub. How deep is the pool? The pools are four feet, six inches at their deepest point. Are there zero entry pools available? Yes. The main volcano pool is zero entry. Are poolside cabanas available? Yes. Cabana rentals are available at the volcano pool. Are there poolside activities? Yes. Activities take place at the volcano pool. Schedules may vary seasonally, but recently there were planned events from 1:00 p.m. until 6:00 p.m. every afternoon, plus a movie under the stars in the evening. Events may include: Hula Hoop Contests, Disney Trivia, Dance Parties, Chalk Art, and others. Weather permitting, there is a free campfire with s’mores. Anything else? 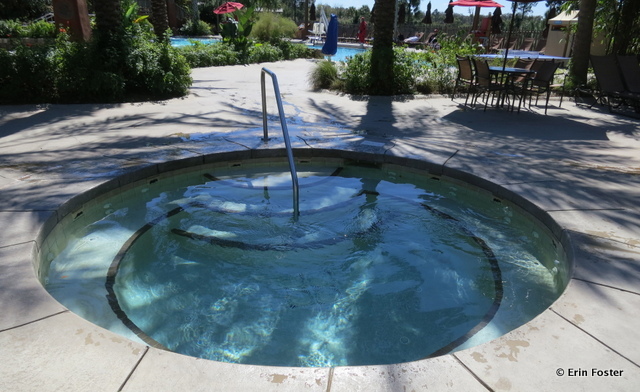 While there is no hot tub, one area of the pool, located near the slide drop point, is kept warmer than the rest of the pool. While there are plentiful beaches here, there is no swimming allowed in the lake. How many pools are there? 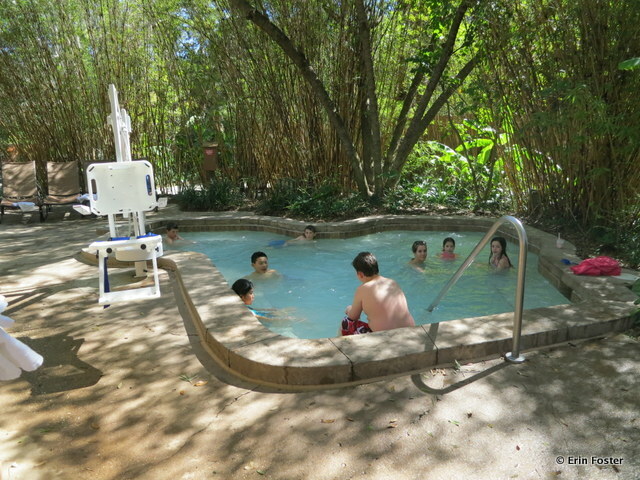 Six total, five at the main Saratoga Springs resort, plus one small quiet pool in the Treehouse Villas area. The main feature pool, High Rock Spring, is located in the Carriage House area. The Paddock area pool also has many interactive features. What is the pool themeing? Off to the races. What’s the kiddie pool situation? There is no traditional kiddie pool, but there are children’s interactive spray zones at the High Rock and Paddock pools. Are there water slides? Yes. There are small and large slides at the High Rock and Paddock pools. Is there a nearby playground? Yes. There are playgrounds next to the Paddock and Congress Park pools. What’s the nearest food option? The On the Rocks pool bar, adjacent to the High Rock pool, offers drinks and a small selection of packaged snacks. For more substantial nearby food, go inside the main building to the Artist’s Palette quick service restaurant. The Paddock Pool has a snack bar offering drinks, salads, and hot and cold sandwiches. There are also breakfast food offerings at the Paddock pool bar. There are no food offerings at the other pools. Are there showers at the pool? Yes. There are showers and lockers in the restrooms adjacent to several of the pools. Are there hot tubs? Yes. There are hot tubs at all the Saratoga pools. How deep is the pool? The Saratoga pools have a maximum depth of five feet. Are there zero entry pools available? Yes. 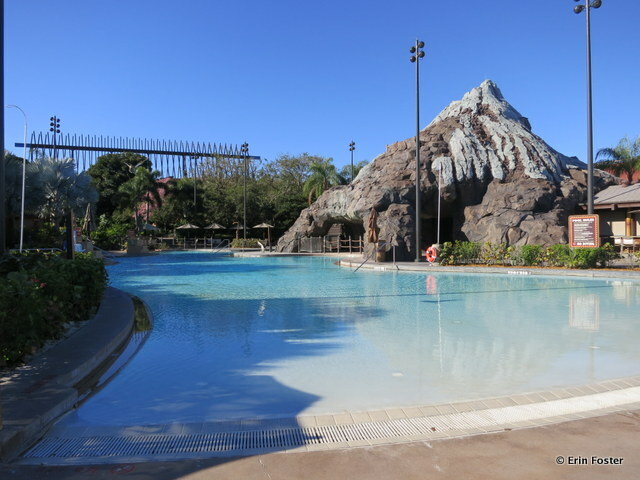 The High Rock and Paddock pools have zero entry access. Are there poolside activities? Yes. Activities take place at the High Rock pool. Schedules may vary seasonally, but recently there were planned events from 1:00 p.m. until 6:00 p.m. every afternoon, plus a movie under the stars in the evening. 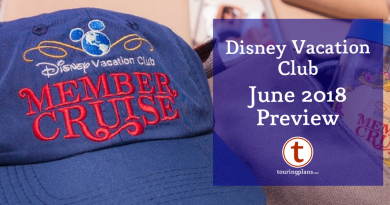 Events may include: Bingo, Poolside Crafts, Courtyard Games, Name That Disney Tune, Critter Competition, and others. Additional activities may be available at the Community Hall behind the pool. Weather permitting, there is a free campfire with s’mores. Anything else? This is a large resort. If you think you’ll want to spend a lot of time at the High Rock or Paddock pools, try to request a room nearby. 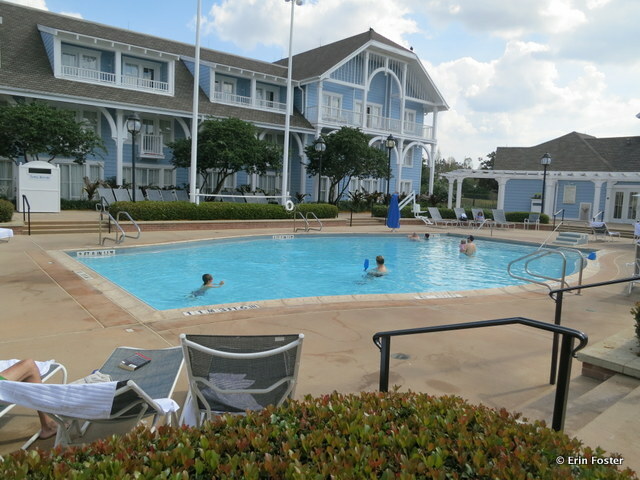 The pool at the Treehouse Villas area is quite small and extremely quiet, Treehouse guests looking for more activity will want to head over to the main resort. How many pools are there? Two. A main feature pool at the Lodge and a smaller quiet pool at the villas. What is the pool themeing? Northwest Wilderness. What’s the kiddie pool situation? 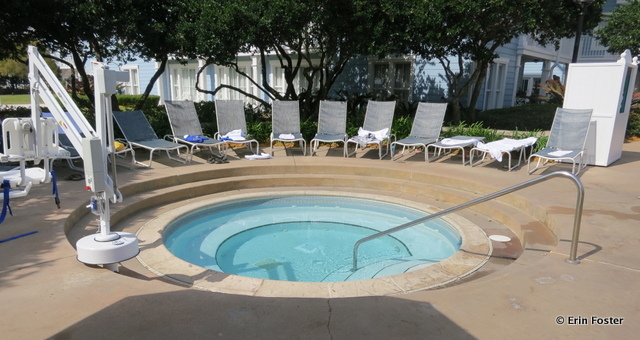 There is a traditional kiddie pool adjacent to the main feature pool. Are there water slides? Yes. There is one smallish slide at the main feature pool. Is there a nearby playground? Yes. There is a playground on the beach near the marina. What’s the nearest food option? 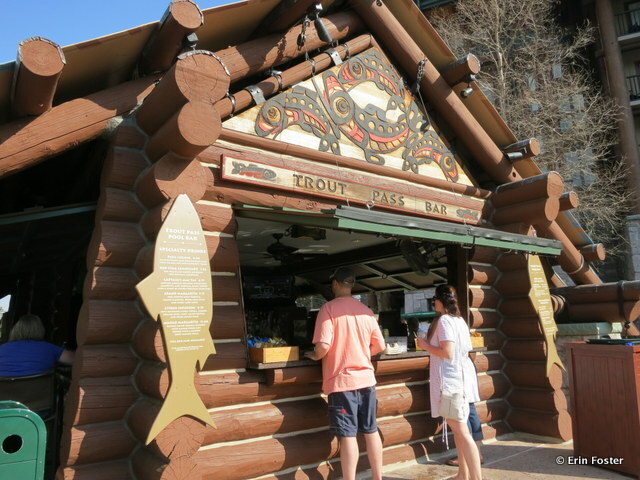 The Trout Pass pool bar offers drinks and a small selection of packaged snacks. For more substantial fare, go inside to the Roaring Forks quick service restaurant. There are no food offering at the villas pool. Are there showers at the pool? There are showers in the rest room at the health club, which is shares restrooms with the villas pool. Are there hot tubs? Yes. There are hot tubs adjacent to both pools. How deep is the pool? The pools have a maximum depth of four feet, six inches. Are there poolside activities? Yes. 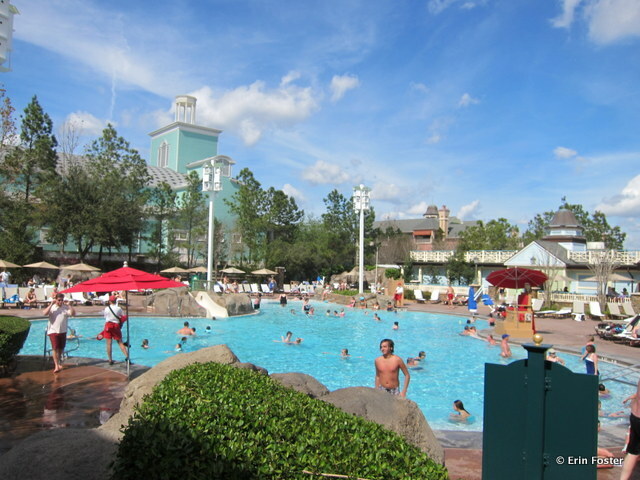 Activities take place at the main feature pool. Schedules may vary seasonally, but recently there were planned events from 1:00 p.m. until 6:00 p.m. every afternoon, plus a movie under the stars in the evening. Events may include: Sand Soccer, Temporary Tatoos, Giant Board Games, Sand Castle Construction, Goofy Bingo, and others. Weather permitting, there is a free campfire with s’mores. Anything else? The main pool features a working geyser. Look for it to erupt about once per hour. There are often hair wrap artists located at the main feature pool mid-day. While there are plentiful beaches here, there is no swimming allowed in the lake. How many pools are there? Four total. The main Stormalong Bay pool is shared by the Yacht & Beach Clubs. 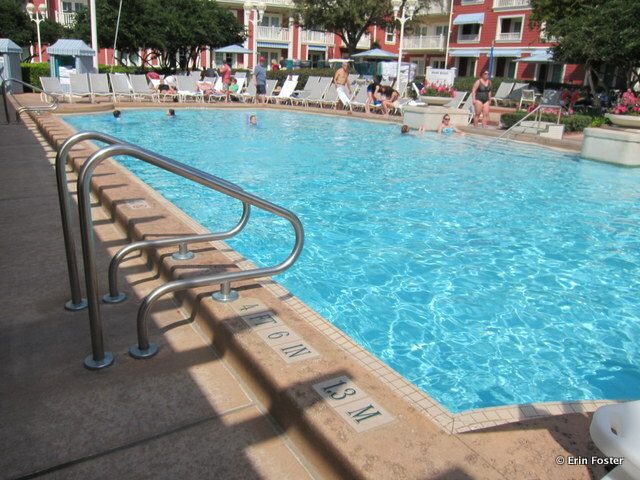 There are three small quiet pools, one each at the Yacht Club, Beach Club, and Beach Club Villas. What is the pool themeing? Elegant seaside resort, with a giant shipwreck in the middle. 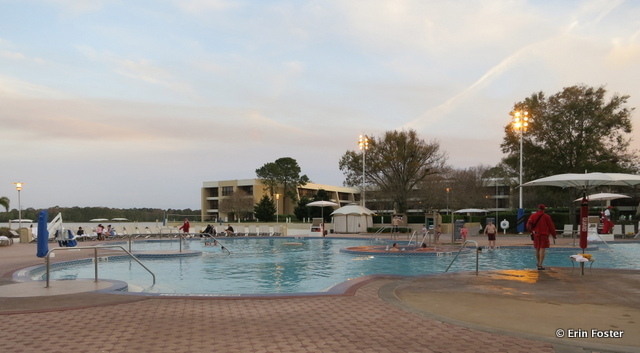 Stormalong Bay is the largest and most elaborate pool at Walt Disney World, encompassing three acres of water play. 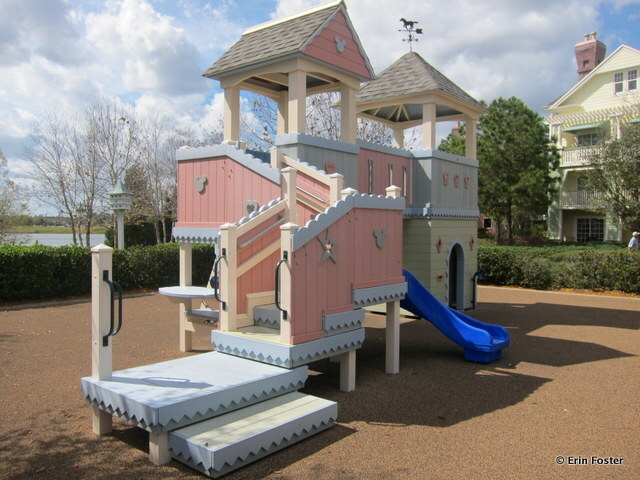 The section nearest the Yacht Club features a real sand bottom – perfect for castle building. Other areas include a “lazy river” for floating along on a raft or pool noodle, a swirling whirlpool, and calm soaking areas. Many consider it to be a mini water park. What’s the kiddie pool situation? There is no traditional kiddie pool, but one area of Stormalong Bay is kiddie pool depth and very appropriate for toddlers. Are there water slides? Yes, two. There is a small slide near the beach in the Stormalong Bay area, under the big ship. The large slide starts at the big ship; this is the largest water slide at a WDW resort. Is there a nearby playground? 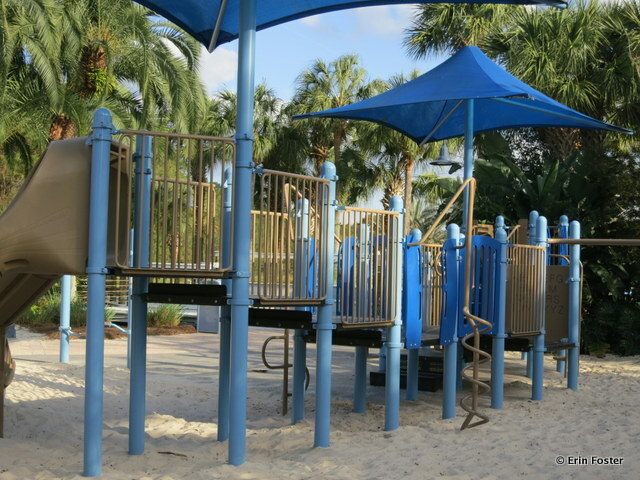 There is no playground, but you will find plenty of beach space for kids to run around. What’s the nearest food option? 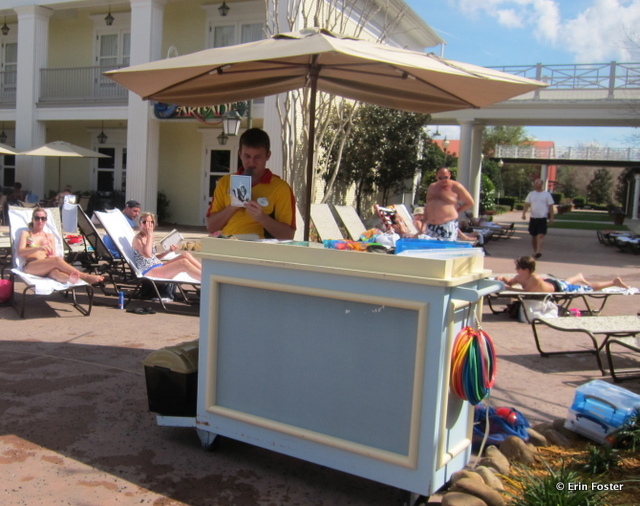 The poolside bar, Hurricane Hanna’s, was completely refurbished in early 2013. Hanna’s offers drinks as well as hot and cold sandwiches, as well as some substantial bar appetizers. Additionally, Beaches & Cream Soda Shop offers a full service menu of comfort food, and a takeout menu of ice cream treats. There are no food options at the other pools. Are there showers at the pool? There are showers at the Ship Shape health club adjacent to Stormalong Bay. Are there hot tubs? Yes, there are hot tubs located near all the pools. How deep is the pool? The quiet pools are about four feet, six inches deep. Stormalong Bay is three acres big. The depth in some sections is just inches. 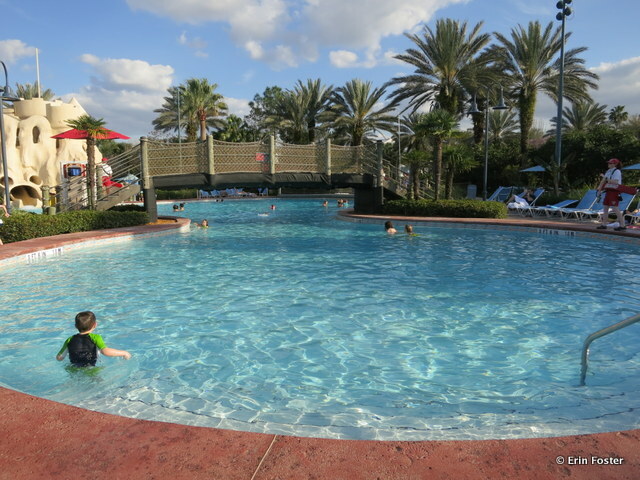 The lazy river is approximately eight feet deep, the deepest area at any WDW resort pool. Are there poolside activities? Yes. Activities take place at Stormalong Bay. Schedules may vary seasonally, but recently there were planned events from 1:00 p.m. until 6:00 p.m. every afternoon, plus a movie under the stars in the evening. Events may include: Chalk Art, Arts & Crafts, Disney Trivia, Pin Trading, Volleyball, and others. Weather permitting, there is a free campfire with s’mores. Anything else? Stormalong Bay is largely considered to be the best pool on property. In order to prevent pool hopper overcrowding, cast members are very strict about checking guest identification. If you’re not staying at the Yacht or Beach Club (including the villas), then you’re not swimming at Stormalong Bay. There are often hair wrap artists located at the main feature pool mid-day. While there are plentiful beaches here, there is no swimming allowed in the lake. 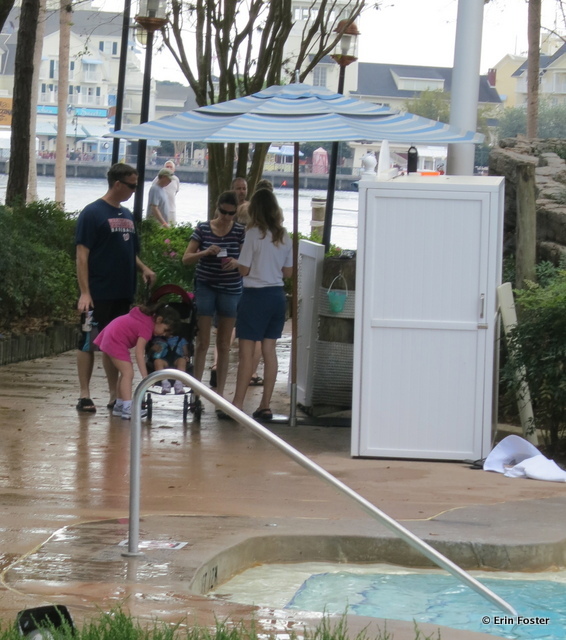 There is a Pick-A-Pearl kiosk located on the walkway next to Stormalong Bay. 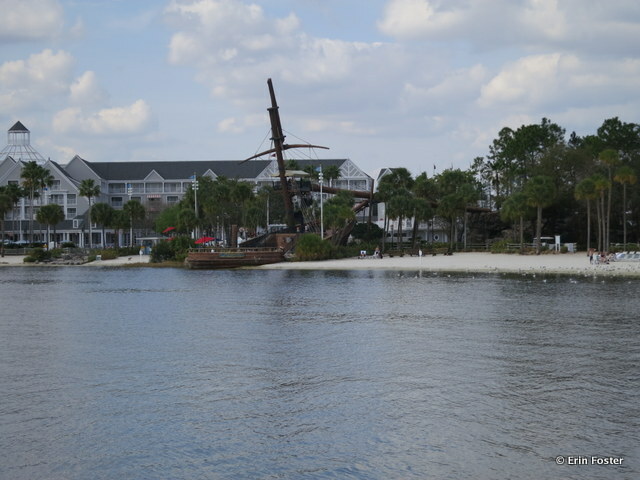 Yacht & Beach Club, Stormalong Bay shipwreck from a distance. The slides start at the wreck. And that concludes our series on the pool situation at the Walt Disney World resorts. Happy swimming! 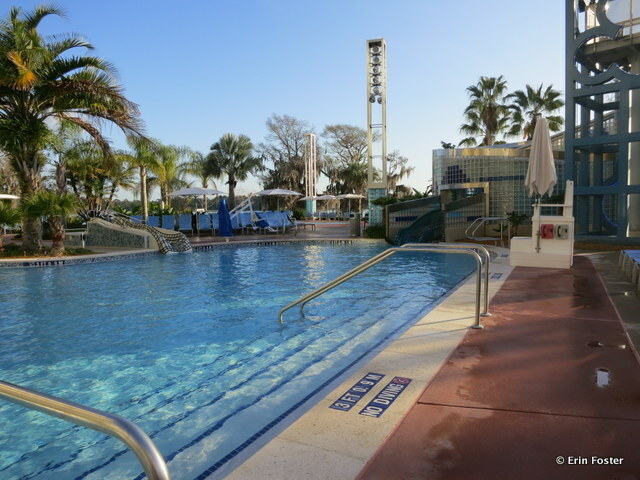 Here’s an update you might want to add — the Bay Lake Towers pool does indeed have a zero-depth entry. I apologize for the oversight. Making the update now. Thank you. Thanks for all this info!! Also, for the Beach Club writeup, does the sand bottom part of Stormalong “count” as zero-depth entry? It occurred to me that there may be ADA-compliance rules about what you can and can’t call a true “zero-depth entry.” I know I always look for those type of pools so it’s an important detail for me. With a 4 year old and 9 year old, little one is too big for kiddy pools but not really tall enough for a “real” pool so zero depth is best for her and easier keep an eye on both at the same time. There is an swim area adjacent to the kiddie sand area that has a depth of about 3 to 3.5 feet. You could be situated to see both those parts of the pool at once. Thanks for all the work on this. It is a great resource to look at where to stay if pools are important to you. We are planning to stay at The Contemporary this September. 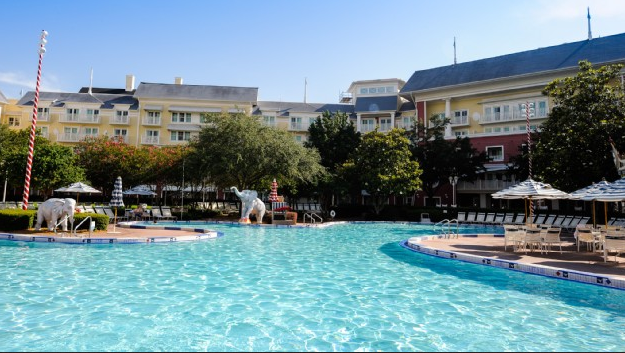 Would you consider the pools at The Contemporary and BLT comparable for kids (ages 6 and 11)? Or will they be disappointed that they can only use the pool at The Contemporary? 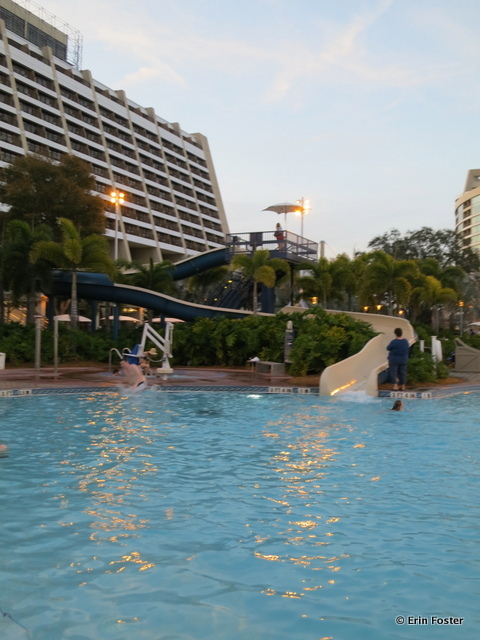 In my opinion, the pools at the Contemporary and BLT are very similar, both have largish water slides and a kids’ splash zone. There’s nothing particularly unique or spectacular at BLT that would cause you feel like you were missing out. There are rental lockers available near the pool for $.50. However, I’m a trusting soul and usually just leave my ID in my shoe or something. Also, many men’s swimsuits have pockets. The resort IDs are totally waterproof. My husband usually just keeps his in his swim trunks. Kat, I’ve only stayed there once, but when I went in April they gave us a wristband. I love reading about the pools. Thanks for compiling these! I did notice that the Saratoga Springs information is a bit outdated since it doesn’t include the updated Paddock Pool information. Thanks for the reminder. Making updates now. — the Courtyard Pool also has a full bar that serves food. When I visited the GF in February the situation was entirely different from what you describe. I think there is a quite a bit of change there due to ongoing refurbs and construction. I’ll add a note that things at the GF may be in flux for a while. Thanks for the reminder. Erin, I think the Courtyard Pool was under refurb at that time, maybe, right? The Courtyard Pool bar looks pretty permanent. 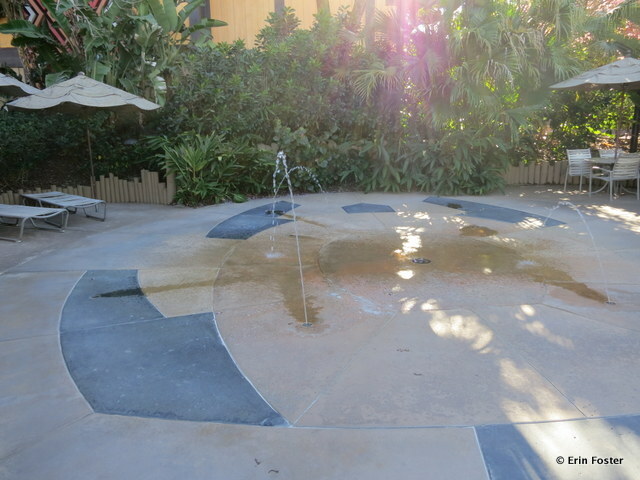 And the refurb’d Courtyard Pool now also has zero entry. Seems the main thing that would be in flux would be the evening outdoor movies and the kiddie activities. And, of course, that small item of whether or not there will be an entirely new pool for the DVC! Darn, I was really hoping for a Swan/Dolphin review with this installment. It seems like with these hotels, you’re never really sure how much of the Disney experience you’re going to get: sometimes they’re really nice and interesting, and sometimes they’re just an aging hotel. Sorry, I’ll try to make a pass by the S/D pools soon to scope it out. Hi Erin, loving these posts! Just to let you know though, at Old Key West, one of the quiet pools – on Turtle Pond Road, has ‘Turtle Shack’ next to it. It serves drinks and food (not a lot just nachos, hotdogs etc). Often the opening hours are short, in Sep it’s 11am-5pm, but it does exist! Also, that same pool is definitely deeper than 4ft in some places – I’m thinking it’s about 4ft 10inches? But definitely more than 4ft! OK – making the fix. Thanks. I heard Polynesian is putting in a hot tub. Is this true? 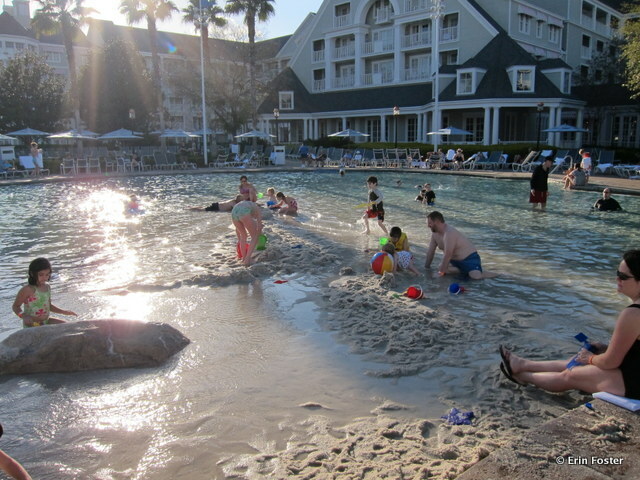 We stayed at the Caribbean Beach Resort last year with our two boys, at the time ages 7 and almost 4. We were doing all things pirate, and we spent two half days at the pool, loving the slides and the kiddie play/slide area. We are looking at going back, this time sometime between Thanksgiving and Christmas to enjoy the holiday offerings. We were thinking about the Wilderness Lodge, but am afraid the boys will be disappointed in the pool. From the pictures the slide seems really small. Is it about the size of the smaller slide at CBR? What other resorts would be good for the holidays and the pool? 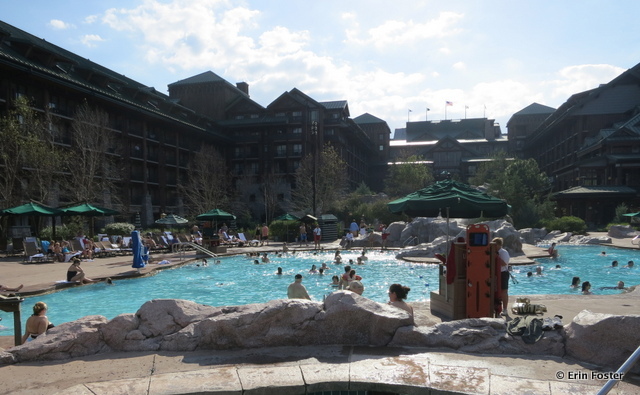 The themeing at the Wilderness Lodge is my favorite in all of Walt Disney World (particularly at Christmas); however, I have to agree that the pool area could be a bit better there. The slide at the WL is fairly small compared to some of the other resorts. Also, the holiday decorations at the Beach Club are fun. Every year they assemble a giant gingerbread carousel in the lobby and there’s a terrific holiday train display at the Yacht Club next door. Stayed at Beach Club, Sept 2013. Best pool(s) at Disney. 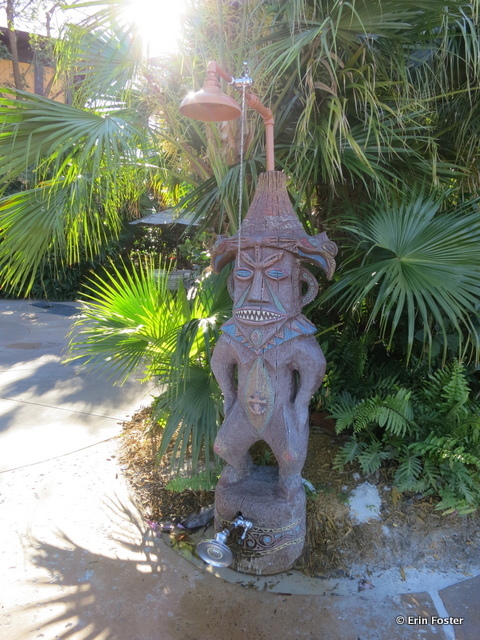 Staying at Polynesian, Sept 2014. 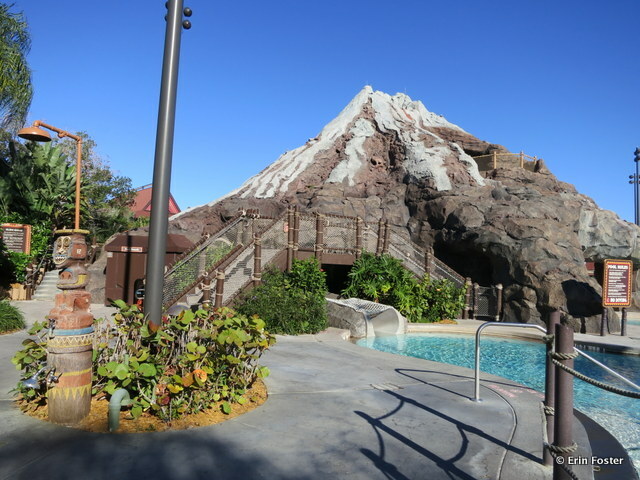 Any truth to the rumor that the Nanea Volcano pool will be closed?? So looking forward to finally staying there, but very worried about the construction situation. hi Erin, thanks again for such a great topic. we are fans of the dolphin, staying again this mid august. but this time with a baby and toddler along. cant remember the pool situation, since last time there mostly just went to the parks, no children along. i do however remember the music, oh well, my least favorite. but probably wont matter with all the activity in slide pool etc with the little ones. my question: you did say you would check out the dolphin/swan pools as well sometime. so im wondering how about a quiet spot/pool area whenever i have a chance to scoot away, leave the littles to my son and daughter in law? ha ha. the priveleges of grandparents, an escape route!